Techncial Analysis:Can Encana break resistance at $36? Can Encana break resistance at $36? 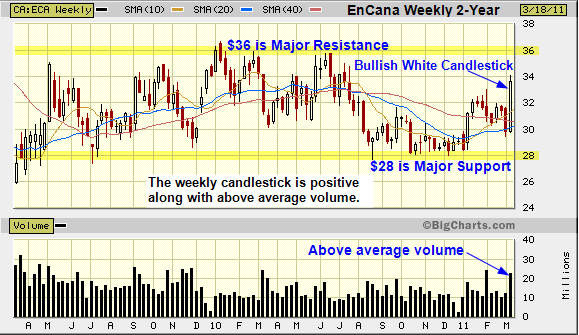 Bullish white candlestick on the weekly chart for Encana. The major trend and intermediate trend are both sideways. The near-term trend (less than three weeks) is up. Major support is $28: liquidate longs if Encana breaks support. Major resistance is $36: add to long positions if Encana breaks resistance. Above average volume on the bullish white candlestick. To trade online, you need a grasp of both technical and fundamental data. Natural gas the next ‘green hope written by Gwyn Morgan is an excellent article. After months of quiet negotiation, energy giant Encana Corp has agreed to buy a minority stake in a natural gas export project that is positioned to redraw Canada’s energy map. Encana in the largest natural gas producer in Canada. Visit the Encana website to research the fundamental data on the company. Some of the other Canadian stocks featured on this site include: Suncor, Precision Drilling, RioCan, BMO, Shoppers Drug Mart and BCE . This entry was posted in Stocks and tagged Bullish Candlestick, resistance, support on March 20, 2011 by Trader.